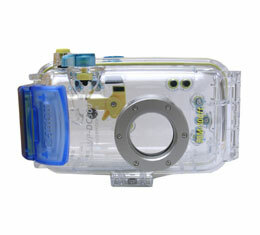 Canon Waterproof case WP-DC300 for the Canon PowerShot S50, S45, S40, and S30. This case can be used underwater in depths down to 30 meters (100 ft.) and in wet or dusty environments. The following controls/components will still work with the case on: Tripod Socket, LCD Screen Display, Zoom Lever, Shutter Button, Shooting Mode Dial, Multicontroller, Replay Lever, Menu Button, Display Button, Flash/Index Button, Macro/Jump Button, Exp/WB/AEB/FE Button, MF Button, and Light Metering Button. Case includes: Neck strap, wrist strap, silicone grease for Waterproof seal, anti-condensation solution, user guide.